For years, I’ve seen the designation, Geographic Center of Nevada, indicated on various state maps and atlases. I wondered if the spot was marked by some kind of monument or sign. What does the geographic center of Nevada look like? Checking the usual reference books wasn’t particularly enlightening as most simply referred to a spot that was “26 miles southeast of Austin.” On maps, it was shown to be somewhere in the northern part of the Monitor Valley. While the precise definition of a geographic center is something usually debated by mathematicians, who don’t always agree on how it is determined, it is generally defined as the place that is the exact center of a geographic location, such as a state or country. So recently I decided to take a trip to this hallowed ground with the crew of the Wild Nevada TV show. To find the exact coordinates, I checked various geologic web sites. On one, www.netstate.com, the geographic center was said to have a Longitude: W116° 55.9, Latitude: N39° 30.3. However, another web site, www.americasroof.com, noted that the center was Longitude: W117.0667° and Latitude: N39.55°. And the United States Geological Survey indicated that center was at W116° 38’ 13.3 and N39° 19’ 11.7 but the agency recently revised its data using technologies not available when the geologic center was first marked in 1962. Now, according to the USGS, the geographic center is positioned at W116° 37’ 56.0, N39° 19’ 48.0. With all this information in hand, I grabbed my hand GPS (Global Positioning System) unit, punched in the various coordinates and hit the road. We headed east on U.S. 50 to a point about 37 miles east of Austin. Here, a dirt road, known variously as Nevada State Route 882 or the Old Belmont Road, heads south through the center of the Monitor Valley. This is a four-wheel-drive journey. My GPS guided us south about 12 miles to a rough dirt road that headed east. We turned onto the road, which was fairly bumpy. After a couple of miles, we parked and walked another half-mile into the sagebrush, following the prompts on my GPS. After stumbling around for a few minutes, we finally chanced upon a piece of rebar sticking up through the grass. A laminated sign at its base indicated that we had found the original geographic center (the 1962 version). Apparently, a geocache enthusiast known as CmdrMark (he has a great web site, www.cmdrmark.com) made the same search for the center of Nevada in August 2003. 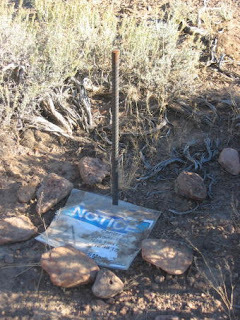 After successfully finding the 1962 and 2003 USGS sites, he marked both with the rebar and signs (as well placing small geocaches beneath the signs). According to CmdrMark’s web entry, the two sites are 3,900 yards apart (the newer site is northeast of the older site). Unfortunately, the sun was beginning to set so, after wandering around for a few more minutes looking for the second site, we called off our search and decided to head back to Austin. Before we departed, I took a moment to soak in the atmosphere. I smelled the sagebrush on my clothing and felt a slight breeze. The warm sun was drifting behind the Toquima Range, to the west, and the desert around me had taken on that special afternoon light that only seems to be found in remote parts of Nevada. It might be the middle of nowhere, and the geographic center of the state, but it felt like home. There’s a big cottonwood on U.S. 50 near Middlegate in the center of Nevada that is filled with shoes. It’s known as the Old Shoe Tree—and there are almost as many versions of the story about how it came to be as there are shoes hanging from it. 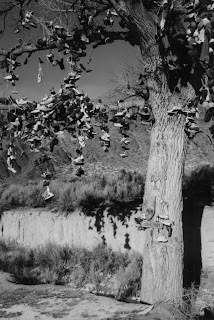 According to Rus Stevenson, who operates the nearby Middlegate Station Bar, located about 110 miles east of Reno, the tale of the Old Shoe Tree dates to the early 1990s. A young couple had been married in Colorado and was heading toward California. As they drove across Nevada, they began to argue. Finally, the husband pulled over the side of the road, under the big cottonwood, and left his new bride there to cool off while he drove to the Middlegate Station for a beer. After tossing back a brew, he returned to the tree and found his wife still hopping mad. In response, he grabbed a pair of her shoes and tossed them into the tree, then headed back to the bar for another beer. After another half-hour or so, he returned to his wife. This time, they managed to patch-up their differences. Unfortunately, he found he couldn’t get her shoes out the tree and they drove off, leaving the footwear hanging from a branch. Over time, others saw the shoes in the tree and began tossing old pairs into its branches. And thus, the legend of the Old Shoe Tree was born. 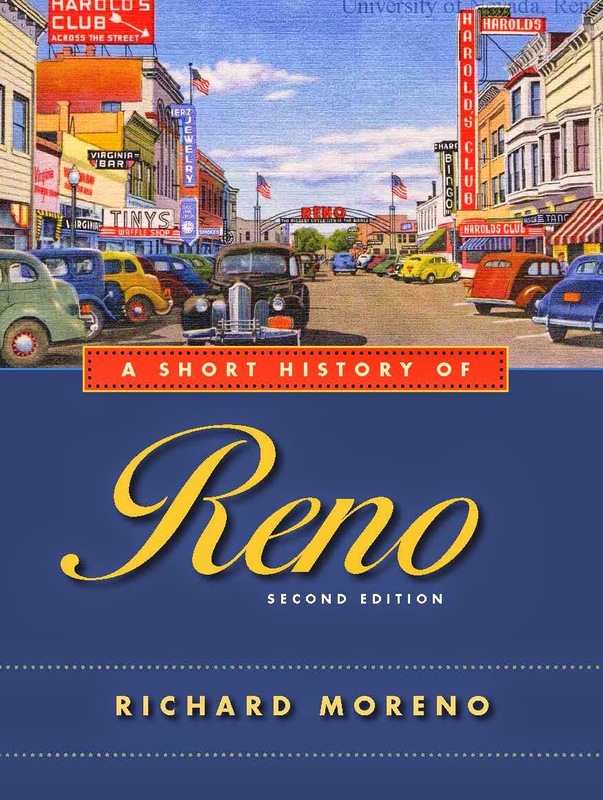 According to another version, the event occurred a few years earlier, the couple was married in Reno, and driving home to Eastern Oregon. After a fight, during which the wife threatened to walk back to Oregon, the husband threw her shoes into the tree and headed to the Middlegate bar. In this version, he returned to her only once and reconciled. However, she insisted he also toss a pair of his shoes into the tree. Then, the apparently bare-footed couple headed home. Other folks came along, spotted the two sets of shoes in the tree, and began tossing their shoes into the cottonwood. Regardless of the origins, it is a fact that for many years people have been throwing pairs of perfectly good shoes into the big tree. These days, there are dozens of leather and canvas sneakers, oxfords, pumps, boots, wing-tips, slippers, sandals, and other foot items hanging from the Old Shoe Tree, which is located about three and a half hours east of Reno via U.S. 50. If you look closely, you might also notice a plastic pink flamingo tossed into the tree. “The largest Shoe Tree in the world . . . So what have you to lose. Perhaps we will never know the sole reason for the Old Shoe Tree. Not too many people have ever seen the unusual and beautiful white stone formations tucked in McCann Canyon in the Monitor Range of Central Nevada. 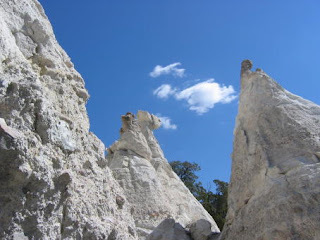 In fact, when I joined a group visiting the site a few years ago, there wasn't evidence of any recent tire tracks leading to the canyon’s snowy-white rock spires and hoodoos. McCann Canyon is located about 20 miles southeast of the ghost town of Belmont, on the eastern side of the Monitor Valley. Since there aren’t any road signs indicating how to reach the canyon, consult a good road atlas such as the Nevada Road & Recreation Atlas by Benchmark Maps. The trip to the canyon was definitely four-wheel drive country. After crossing the Monitor Valley from Belmont, we veered onto a fairly well maintained dirt road that led southeast into the Monitor Range. After passing a handful of remote but picturesque ranches, the road narrowed and began to climb into the mountains. We drove for about a dozen miles through forests of scruffy piñon and juniper trees before finally spotting the chalky white hills of McCann Canyon. A more rugged dirt track branched from the main road and toward the small side canyon containing the formations. Here, the trees reluctantly parted to allow our vehicle to pass—and in some places they seemed to reach for us as we slowly drove by. We continued driving for about a mile or so before deciding the hike the rest of the way. Our destination was the back wall of the canyon, which appeared to contain a large white cluster of jagged outcroppings and cone-shaped rock pillars. As we grew closer, we could see that the formations were visually spectacular. To the sides, were coffee-colored cliffs, some with small caves that looked as if they had been created by a giant ice cream scoop. Ahead, we passed pointed mounds of rough, chalky stone that resembled large anthills. Nearing the back of the canyon, we climbed a steep hill of loose, sediment—it was like walking up a huge sand dune—that provided a good overview of the canyon’s alabaster formations. From here, the hoodoos were incredible. Some looked like massive shark teeth while others had rounded tops. While I’m no geologist, it appeared that the stone sculptures had been created by erosion, as wind and water wore away softer rock and left behind these magnificent shapes. We climbed down into the forest of rock towers. Up close, they seemed to be made of different kinds of rocks. They were rough to the touch, feeling like badly mixed concrete. Some were topped with knobs or flat blocks while others were pointed and sharp. If you looked long enough, you could begin to imagine there were faces in the stone or animal shapes. Some were etched with horizontal lines—perhaps indicating a water line or a different layer of stone—while others had lines that seemed diagonal, as if the area had been twisted like a wet dishrag by some kind of powerful geological force. As we wandered the site, we were struck by the simple fact that it appeared no one had been there in a long, long time. There were no rusted cans, broken glass bottles, plastic wrappers or discarded gun shells—items too often found in remote, beautiful places in Nevada. It was just the ghostly white spires, near-total silence and us. Occasionally, a squawking bird interrupted the quiet. Carefully, almost reverentially, we explored the site, recording our discovery with cameras and our memories. We knew we were somewhere special in a remote corner of Nevada and that we would probably never be back. And we wanted the next person or persons who stumbled upon this site to be able to have a similar experience. A few years ago, I took a German travel writer to Berlin, Nevada. He wanted to see how the early 20th century mining town compared to his famous metropolis. He was amused by Nevada's version. The truth is that Nevada’s Berlin is at best a footnote in the state’s rich and colorful mining history. At its peak, it could claim about 300 residents and produced only a trickle of silver. Berlin’s most significant contribution might be that it has survived nearly intact. 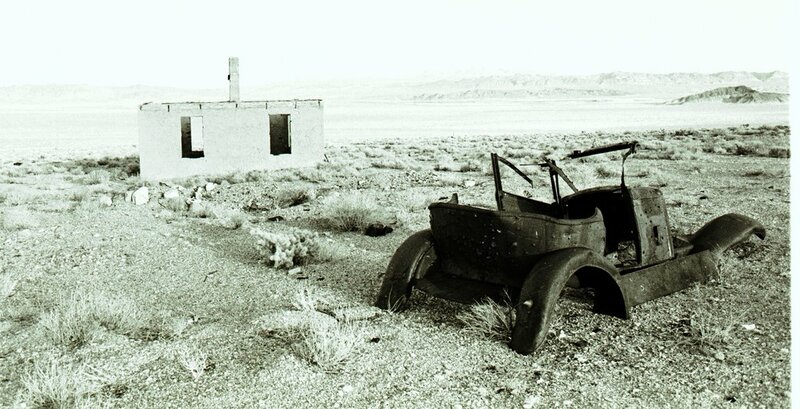 This distinction has allowed it to become the only ghost town in Nevada that is a state park. Berlin was one of the many camps that cropped up around the time of Nevada’s second mining boom, which was spurred by the discovery of silver in Tonopah in 1900. In Berlin’s case, silver was discovered in 1895. About two years later, a town was founded on a steep shelf in the Shoshone Mountains, overlooking the remote Ione Valley. The post office opened in July 1900 and by 1905, the town had a 30-stamp mill, large company store, an auto repair business, assay office, saloons, school and a boardinghouse. Two years later, the mill and mine closed and Berlin entered its first depression. The town briefly revived in 1909 when the mine reopened and a cyanide plant to process ore was constructed below the town. By 1918, however, the post office closed and the town had begun its final slide. For the next decade, the tailings were reworked and a mining company maintained a presence in the former camp—which is why it was saved the fate of most ghost towns. While the large, wooden mill was stripped of its metal stamps and other equipment during World War II, it has survived the years of neglect and is probably the most impressive structure in the town. In the 1970s, Berlin was acquired by the Nevada Division of State Parks. The park service stabilized the worn, wooden buildings and erected interpretive signs. During the summer months, guided tours of the town site are offered. The tour is worthwhile because the park rangers do an excellent job of recreating the mood of what life was like in this remote mining camp. For instance, when you enter one of the drafty, simple, miner’s shacks you can’t help admiring their toughness and spirit. An uncomfortable-looking cot, cast iron stove, tiny metal tub, table and chair were the main furnishings. One of the cabins that is in particularly good condition was used by the mining company’s caretaker until the 1970s. It’s a remarkable little cottage that well illustrates how just about anything was utilized in the construction of these places. For example, cardboard boxes have been nailed to the inner walls to serve as insulation. Other structures in the park (about a dozen remain standing) include the assay office and a machine shop. Behind the mill, you can also find an ore cart trestle and track system leading to several shafts dug into the hills above the town. Near the mines, there are ruins of an equipment building, ore bins and chutes, cables and other mining paraphernalia. You can also find the remains of an unusual multi-hole outhouse. If you search the sagebrush around the buildings, you can stumble onto other remnants of the town. For instance, in one place about a half mile south of town you can spot the former site of one of the saloons by all the broken glass on the ground. A small cemetery southeast of the town has a few graves—most of the dead were moved to other towns when the residents relocated after Berlin’s decline. By the way, Berlin was named by German prospectors after the Old World Berlin. The German journalist thought that was pretty funny, too. Berlin-Ichthyosaur State Park is located about 300 miles north of Las Vegas via U.S. Highway 95, State Route 361 (to Gabbs) and State Route 844. For more information contact the Nevada Division of State Parks, 775-687-4370. 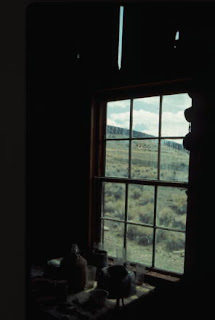 Of the hundreds of mining ghost camps in Nevada, few were as short-lived as Blair. Located two miles northwest of the mining town of Silver Peak, Blair was a company town, which was built between 1906 and 1907—and completely abandoned by 1918. Blair is located about two hours south of Fallon via U.S. 95. At a point 30 miles west of Tonopah, turn south on State Route 265 and continue 19 miles. Blair is located on the hillside, a half-mile to the west via a good dirt road. Blair was created because the Pittsburgh Silver Peak Gold Mining Company needed to build a mill site near the Silver Peak area’s mines. Unfortunately, the landowners in Silver Peak were greedy and held out for top dollar for their land. In response, the Pittsburgh Silver Peak company quietly purchased property a few miles north of the town. There the mining company laid out a townsite, which was named in honor of John I. Blair, an eastern banker who had developed the Silver Peak mining district. In addition to a town, the mining company constructed a 100-stamp mill, the largest mill in the state at the time. Additionally, it built a 17.5-mile railroad, called the Silver Peak Railroad, which ran from Blair to a junction on the main line of the Tonopah & Goldfield Railroad. A 14,000-foot aerial tramway was constructed to carry ore from mines on the opposite side of the mountain to the mill. By 1907, Blair has a few dozen homes, a couple of saloons, a newspaper, a handful of businesses and a two-story hotel. Historian David Myrick (author of the excellent two volume "Railroads of Nevada" books) notes in his description of the Silver Peak Railroad that Blair settled upon a particularly unique way of paying for some of its public services. As the town developed, it found that there was no money for fire hydrants. The residents decided to conduct a minstrel show with local talent, the proceeds of which would help pay for this essential service. The performance was awful, according to Myrick, and a donated case of whiskey inspired the performers so much that one fell off the stage. One observer is said to have remarked, "the show was so terrible it was entertaining." Silver Peak mines played out within a few years and the mill ceased to operate by 1915. The large facility was dismantled and sold to another mine and the railroad was torn up in 1918. Today, it's easy to miss the handful of remnants of Blair. Sitting on a slope overlooking the road, Blair has almost blended back into the surrounding sagebrush-covered hills. The most noticeable ruin is a large concrete and brick skeleton of a building that still has its chimney and walls intact (perhaps the remains of the old hotel?). A smaller, square concrete building sits a few yards away. Parked in the desert between the two structures is the rusted hulk of an old car, which appears to be from the 1920s or 30s. Exploring behind the larger building, you'll still find a handful of other foundations, including another partial chimney, as well as other hints of the mining town that was once here. About a half-mile west of the townsite are the massive foundations of the once mighty Pittsburgh Silver Peak mill. Huge concrete footings line the mountainside (the mill was built on the hillside to take advantage of the gravity flow of the ore) and provide an idea of the mill’s great size. On the top of a hill above the foundations, you can find another remarkably intact concrete building, which appears to have been an office at the mill site. Still visible is the flat, former Silver Peak Railroad bed, which runs parallel and below the mill site. About two miles south is Silver Peak, which is home to a handful of people as well as an operating mine.